The market for office space in Switzerland is recovering. But the supply of office space is still rising faster than demand. And digitalization is presenting new challenges for providers of office buildings. Office space occupancy and therefore also demand have risen in Switzerland over the past year. This is thanks to good economic conditions. Although the growth in occupancy lagged a bit, 68,400 new workspaces have been created in the last year. The majority of these can be attributed to the service sector, which grew by 1.7% to 49,600 spaces. Office space growth was subdued by reduced occupancy in the banking, insurance, wholesale trade, and telecommunications sectors, which have reduced their employee numbers by over 10,000 in the last 12 months. Nonetheless, demand for offices was positive overall. The Credit Suisse real estate study estimates that the additional demand for office space in the past year was 596,000 square meters. In 2017 this figure stood at 325,000 square meters and in 2016 it was 215,000 square meters. This year, additional demand is also likely to be substantial, if a little lower. At the same time as demand increases, the supply of office space continues to grow moderately. This is despite investors being slightly more cautious as a result of higher vacancy rates in the office space market. But the sustained low interest rates and limited investment alternatives has meant that the construction of real estate and office space remains attractive. 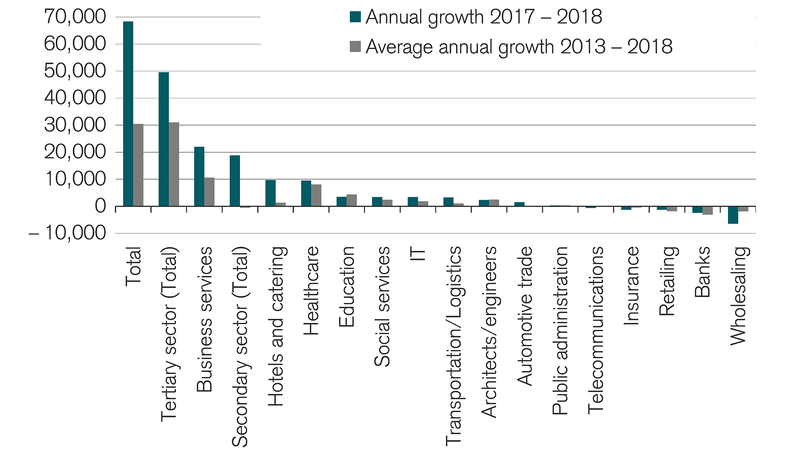 Accordingly, office space offered online increased further in 2018. In the second quarter of 2018, the supply of office space offered online across Switzerland increased to 2.65 million square meters, which corresponds to a supply rate of 4.9 percent. The effective supply of office space should, however, be even higher. It is thought that not all real estate available for rent is advertised. As a result of high vacancy rates, increasing numbers of properties do not even appear on platforms, in order not to be regarded as non-sellers. There is less demand for large properties above 2,000 square meters in particular, and these remain empty for a long time. Such properties are only advertised at certain points and as partial spaces. The authors of the real estate market study surmise that at least 430,000 square meters disappear into this shadow economy. However, rising vacancies primarily affect the middle and outer office markets, whereas in centers such as Zurich and Bern, demand for offices has risen thanks to good economic conditions. 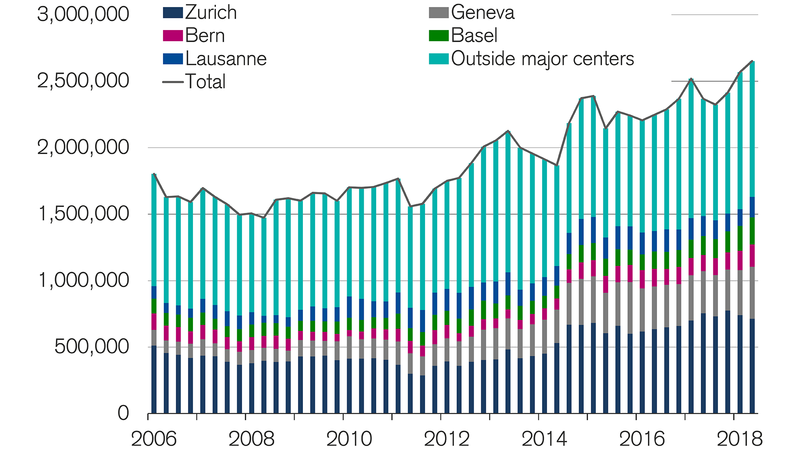 Vacancies in the city of Zurich have thus declined for the fourth year in a row in 2018. They are now 36 percent lower than the peaks of 2014. You can find out more about the office space and commercial space markets in Switzerland in the Credit Suisse real estate study. Read about the regions in which the office market has already recovered and where the recovery has yet to come. Office space supply and demand are not only influenced by the economy, but also by structural changes. The importance of services is increasing in many industries. Businesses no longer only sell machines and equipment, but also offer associated services. The number of employees in offices is therefore increasing in industrial sectors in particular, but also in other sectors. Advancing digitalization further contributes to the creation of new job profiles that require an office workplace. 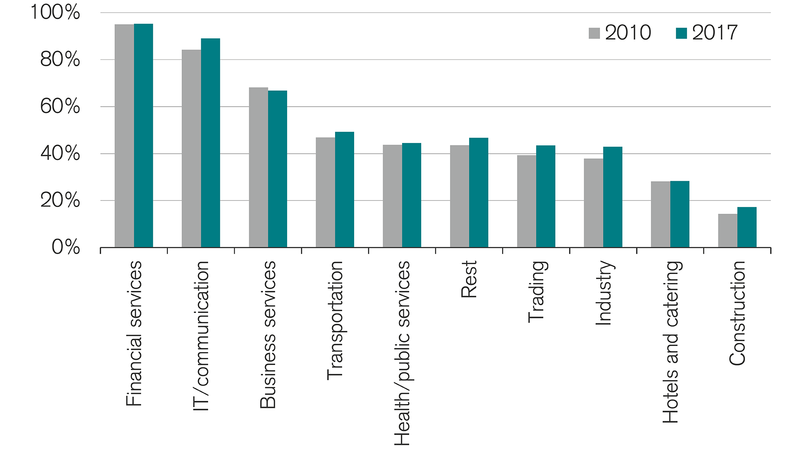 Digitalization in particular is not only providing office workplaces through new job profiles. It is also changing work methods and processes. New forms of work such as job sharing, part-time work, and telework are aided by digitalization; employment relationships are changing in the direction of fixed-term work, flexible working hours, and platform work. There is a trend towards location-independent work. 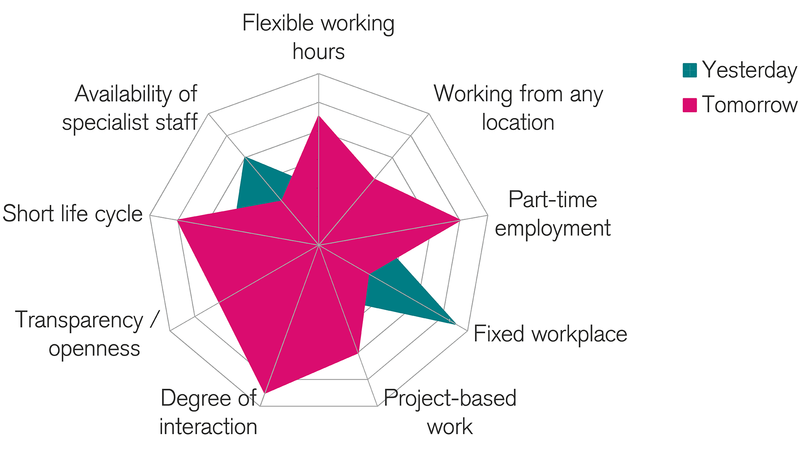 Secondary and tertiary workplaces are gaining in importance. Teleworking from home is especially popular. In 2017, 28 percent of all employees in Switzerland occasionally worked from home instead of in the office. Work is also increasingly being performed in other locations such as train stations, airports, cafes, libraries, or shopping areas. Working world between yesterday and tomorrow; increasingly from inside to outside. Real estate needs to cater to these changes by offering efficiency and flexibility. This could mean flexible room structures that allow employees to adapt the infrastructure to their work processes and to work in an activity-based manner. State-of-the-art office spaces allow the function of the properties to be easily changed. The traditional workplace is becoming less important and is being increasingly replaced by desk-sharing. Such space-saving workplace models, along with advancing automation and the trend towards location-independent working, are reducing demand for office space. However, this development is likely to be offset by tertiarization, advancing digitalization, and the growing working population. We are happy to help. Call us at +41 (0)800 88 88 71 or arrange an appointment. Is active Demand for office space is growing. And so are requirements.